….I feel it in my toes. Yes I really did just quote a Wet Wet Wet song but stay with me for a second. The song goes on “Love is all around me and so the feeling grows.” Well today I’m feeling the love. It’s an absolutely beautiful day here in Kent and later this afternoon I am honoured to be attending a blessing service for a friend who recently got married. With that in mind, I chose a wedding themed portrait today. At weddings you’re surrounded by the friends and family of two people who want to declare their love for each other. It is something really wonderful to see and be a part of because love is all around! Yesterday I talked a bit about context and the struggle to know when and how much of the location or background to show to add meaning to a photo. Another vitally important context to capture is relational. Weddings give you lots of opportunities to capture special moments between loved ones. The photographer’s job then is to see those moments coming and be ready to capture them in a way that shows the special bond between loved ones. 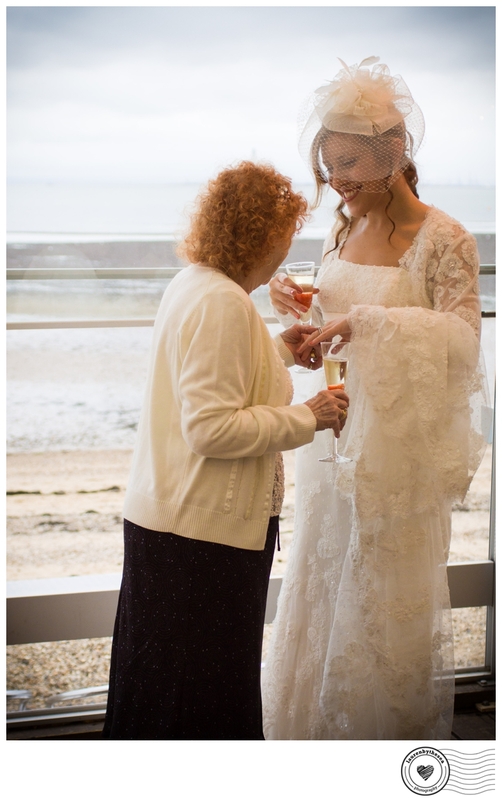 Here the beautiful bride Jessica was showing her wedding ring to her grandmother. A tender & proud moment between generations.